FAYETTEVILLE, Ark. – A good offensive team meets a good defensive squad on Thursday when the University of Arkansas women’s basketball team travels to LSU for a Southeastern Conference contest at 8 p.m.
Arkansas (16-7, 5-4 SEC) averages 75.1 points per game this season while the Tigers (12-8, 3-5 SEC) are holding opponents to just 60.6 ppg, ranking fourth in the SEC. LSU is equally good defensively from 3-point range holding teams to 28% from beyond the arc, again below Arkansas’ average of 31.4% on the year. 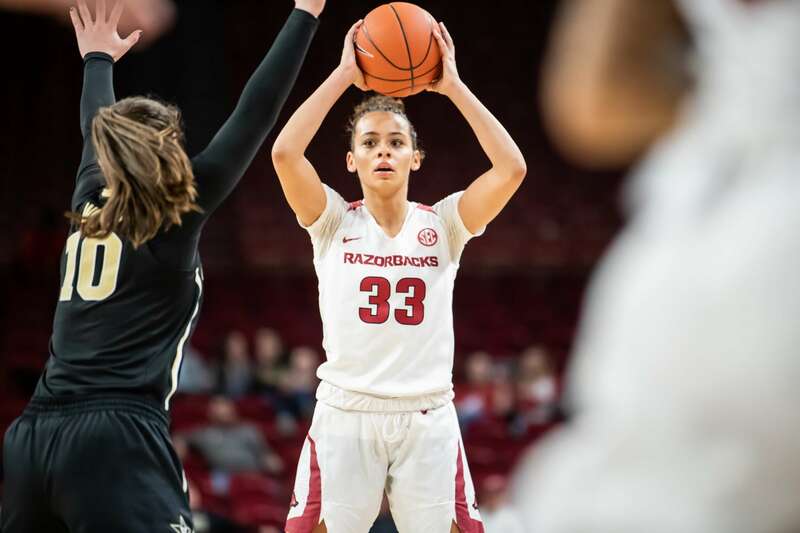 The Razorbacks’ leading scorers, Chelsea Dungee and Malica Monk, together average 32.5 points per game and have helped Arkansas score 69 or more points in all but one SEC game. Arkansas has scored 80 or more points in four conference games while the Tigers have only scored more than 60+ in four contests. The Razorbacks have a clear advantage on the free throw line. Arkansas leads the SEC in conference games shooting .803 from line. LSU ranks 13th with a .647 mark. Arkansas also leads the SEC in all games with 319 makes and fourth with 453 attempts. The game is the first of the final seven regular season contests. Arkansas returns home hosting Auburn on Sunday at 1 p.m. in the team’s annual Play 4 Kay contest. The Razorbacks have a bye on Thursday and then travel to Kentucky and Georgia in back-to-back road games.